Pet Emergency? Call us right away at 870-423-2630! Thanks for visiting the St. Francis Veterinary Clinic website. We are located just off Hwy 62 between Berryville and Green Forest, Arkansas. A map is available on our Contact Us page. 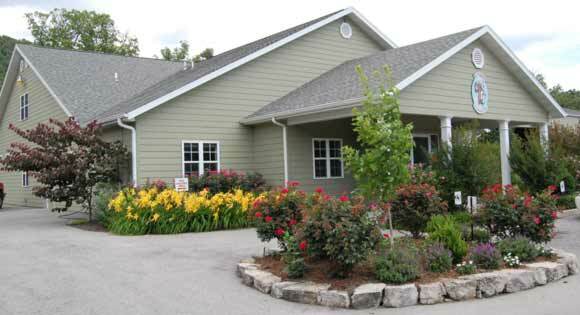 The clinic was established by veterinarian Dr. Ron Eby in 1990. Dr. Anne Brenneke has been part of the practice since January, 2010. Dr. Doug Keeton joined as a part-time veterinarian at St. Francis, starting in September of 2016. In 2018, Dr. Ashley Long joined the clinic as a full-time veterinarian, and Dr. Kellyn Sweeley joined as a part-time veterinarian. The clinic provides a wide range of services for both large and small animals. Whether you need vet care for the family pet or for farm livestock, and whether it's for routine visits or emergency surgery, you've come to the right vet clinic. We’ve got the answers to your veterinarian questions. Take a look at the great selection of items for your pet you can get right online. Dr. Eby was born and grew up in rural Northeastern Oklahoma. He first attended the University of Tulsa and then graduated in Fisherie Biology at Oklahoma State University. He graduated from the Veterinary School at Oklahoma State in 1983. His first job in vet clinics was in a mixed practice in Bentonville, Arkansas. In 1984 he moved to Carroll County, Arkansas and worked at the Berryville Veterinary Clinic until 1990. At that time he opened the St. Francis Veterinary Clinic. Dr. Anne Brenneke has been working at St. Francis since January, 2010. A native of Jefferson City, Missouri, She received a Bachelors degree in Animal Science at the University of Missouri-Columbia, and received her DVM degree from the University of Missouri in 2009. She is primarily a small animal and equine veterinarian. Dr. Keeton joined St. Francis Veterinary Clinic in September of 2016. Dr. Keeton is a native of Oklahoma, and brings 30 years of experience with him. Dr. Keeton is an efficient and knowledgeable doctor. He never hesitates to lend a helping hand as the need arises. Dr. Keeton works three days a week to help with the strain of a busy schedule. "Very great people. Our dog had parvo they got her better and she is doing great thanks to the crew at St. Francis Vet." "Been taking all my animals there for a long time. They are very nice and good. Had one of my mail dogs sniped he had always licked just took him back in and it was no extra charge for this medicine. Also serves all of my other animals." "They have always done an outstanding job on my pets, they are all very Pleasent to be around and really do care about your pets!!! I love St.Francis and will always go to them for my pet care needs." ""Everything about the staff and vets is fantastic. We couldn't ask for a more caring and knowledgeable person than Dr. Anne to take care of our furry babies."" "I know that all my pets are loved by your team. When I take them in they are looked at as if they belonged to your team. When I check out I am not rushed out the door. I know what ever questions I may have I can ask and the receptionist will call the Dr if they don’t know the answer. I don’t feel like I am there just to pay a bill. Everyone of my pets are treated with compassion, and when the exam is over they have been checked from tail to nose." "Everyone is always so nice and helpful, and there when you really need them!" "As always, your service is top notch. I never worry about my pets. I know there getting the best care possible." "I highly recommend this Vet Clinic!! Great staff from front to back, and wonderful doctors."